People fail to measure soft skills because they try to measure them the same way as hard skills such as engineering or finance. They are trying to measure the wrong thing! 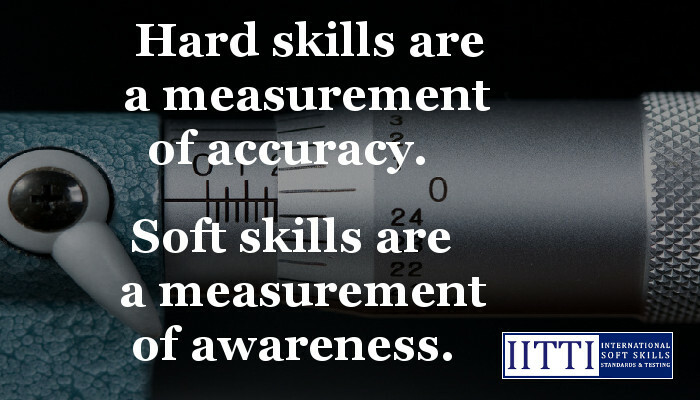 Once we realize that soft skills are about awareness, we can start to measure awareness instead of accuracy. How do you measure awareness? Simple. Measure numbers such as how many times a person is exposed to a certain message, for example. How about an online shoe store from US$1 million to US$1 billion in 8 years. Main reason: fanatical focus on company culture, the soft skills! Every New Hire: 7 Weeks Culture Training! "We view our call center as a branding opportunity. Every phone call is a branding opportunity." Zappos is an online, Fortune 50 shoe shop. Founded in 1999, the company went from US$1.6 million in sales in 2000 to US$1 billion in 2008. In 2009, it was the highest-ranking newcomer in Fortune magazine's annual Best Companies to Work For list (see video at 7:42) and later in the year was acquired by Amazon for more than US$1.2 billion. One reason for Zappos' success? HSBC Global Connections wrote, "Workers get seven weeks of training on company culture and how to make customers happy..."
How many weeks does your company give to your new hires? Forbes magazine talks about how it is all about company culture at Zappos. A death in the family and customer forgot to return shoes, sales rep would send flowers!